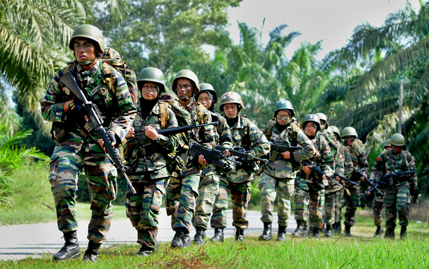 BENTONG, 5 Feb 2014 – Students who joined the Reserves Officers Training Unit (ROTU) have the edge over other students due to their combat and endurance training which can make them excel in any field they choose. UKM Vice Chancellor, Professor Datuk Dr Noor Azlan Ghazali who visited the five ROTU camps here where UKM’s students are finishing their training stints today said those with the ROTU experience will have high endurance level. Officer cadets from UKM and the Islamic Science University Malaysia (USIM) took part in a six day training mission ‘Mempaga Bentong’ for junior, intermediate and senior students which began on Jan 31 and ended today. Prof Azlan who is Commandant of ROTU UKM visited 5 camps which consisted of junior, intermediate and senior cadets. The junior cadets underwent Conventional Insurgency Warfare training in the jungle which involves jungle patrol, ambush and attacking enemy base. Intermediate and senior cadets undertook four training phases of conventional warfare, which involves charging, defence, attack and retreat. All of them will be assessed for awards to be made at the Public Higher Learning ROTU officer’s award ceremony later in July. Focus wwas on the senior cadets because the training mission will determine whether they make the cut or not. Prof Noor Azlan said those who join ROTU will turn into somebody with high endurance level. “If they can make it here whatever comes in the real world after this they will come out triumphant”. He hopes that a programme can be launched to introduce the benefits of ROTU to other students. Also present was the Deputy Commandant of ROTU, Assoc Prof Shamsul Abadi and Lieutenant Colonel Mohd Sahar bin Haji Saidi.